The way to approach Thorington is by bike along the narrow lanes from Wenhaston, jinking and rolling through the fields and then over the heath, before descending down into the deeply cut lane. 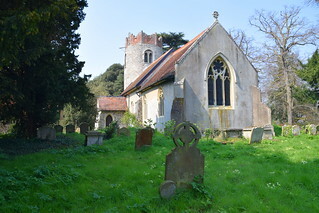 The church with only its former rectory beside it among a boiling of great trees, and on this day in early April 2019 the setting was so lovely that I could forget for a moment that the awful A12 thundered northwards not half a mile from here. With the early spring light cascading through the trees which were just coming into leaf like something almost being said it could have been any time. 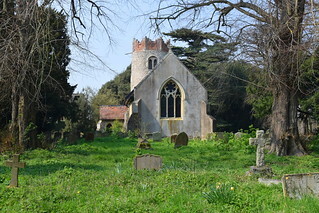 The round tower is one of Suffolk's oldest, and perhaps its loveliest. The pretty battlements were added in the 16th century. The blind arcades that line it are typical of late Saxon/early Norman design, and although there is some evidence of Victorian repair, they don't seem to have been rebuilt. 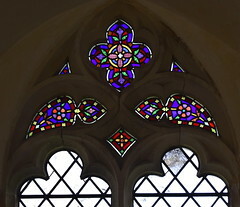 The mock-Norman west window belongs to the 19th Century, however, and this is a hint of what we're going to find inside. Apart from the window and the battlements. Thorington's tower must have stood here like this through the alternating seasons for at least a thousand years. This is one of those churches which is always open, and you step into an interior which is inevitably a disappointment. As at Wissington, Wordwell, Whepstead and, most stupefyingly, Stoven, the Victorians did not think this interior Norman enough, and so they made it more Norman than it was already. At this distance, I'm afraid that much Victorian mock-Norman appears as clumsy kitsch, and of course it does not age well. 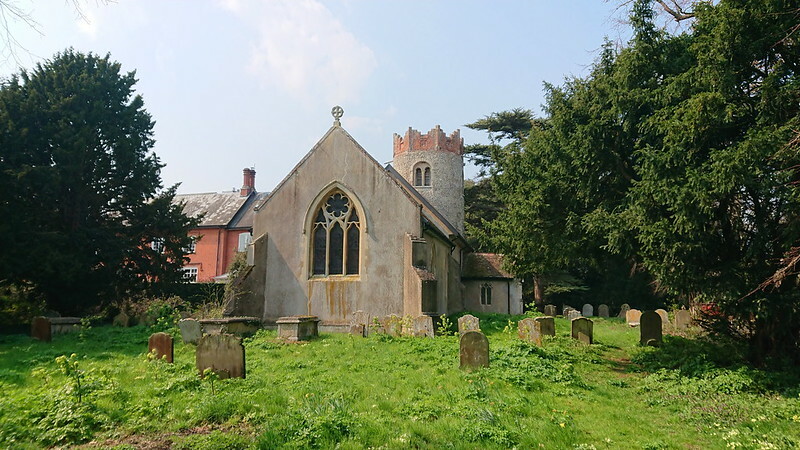 In their defence, this church was certainly near-derelict by the late 19th Century, and the overpowering restoration would have saved it from loss. 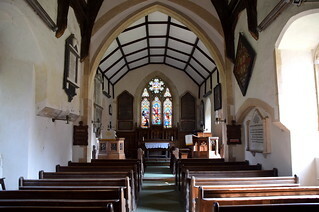 Thus, both the chancel arch and the tower arch are both 19th Century reinventions, the sanctuary a drama of Tractarian coloured glass and painted wood, the prim pitch-pine benches squeezed into the narrow nave. And yet, and yet... there is something haunting about the faded gentrification of this little church, the birdsong in the air, the damp air rising, as though it cannot stop being organic, at one with its setting. Ernest Geldart's reredos has gathered dust, fading gently over the years. 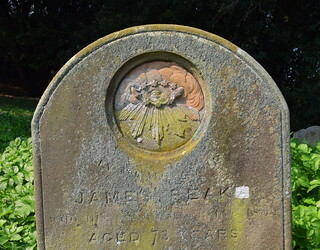 It sits below a good 1858 Heaton & Butler window, interesting to see as it is just before Robert Bayne came along and gave the workshop its glory years. 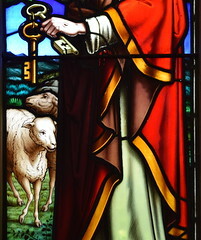 And yet even this attempted grandeur is softened by the lovely window by Thomas Baillie which spills its coloured light across the sanctuary from the north side of the chancel, a naive depiction of Christ handing the keys of the kingdom to St Peter while two little Suffolk sheep look on. There is something not quite right about the depiction, and then it hits you - Christ's hands already bear the scars of his crucifixion. 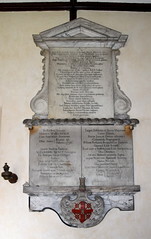 The grand 18th Century memorials to the Bence family seem curiously out of scale in this little church. 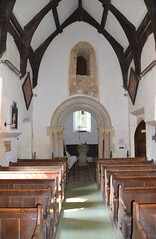 The chancel was rebuilt as part of the 1860s restoration, and so they must have been reset in more or less their original places. 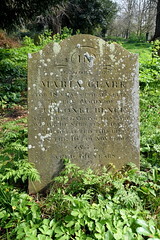 The Bences were the local big family, and presumably also presented their sons to the living. There are some intriguing survivals. One is the gorgeous 14th century piscina that now sits against the raised floor of the Victorian chancel. And turning west you can see that above the Victorian tower arch is another opening, rediscovered in recent years. 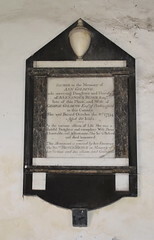 It seems too large to have been a window, perhaps for the ringing of the sanctus bell, and so the only other conclusion that can be drawn is that it was actually a doorway. But why not at ground level? It is easy to imagine a ladder leading up to this entrance could be taken away, or even drawn up, so was there some defensive purpose intended? 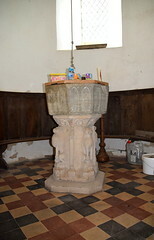 Beneath the tower, the font is a cobbled-together piece, an arcaded font of the 13th Century reset on a typically East Anglian 15th Century stem, the lions surviving, the woodwoses not. The First World War memorial is a curiosity, the flanking pillars like Moorish minarets, or were they intended as shells? 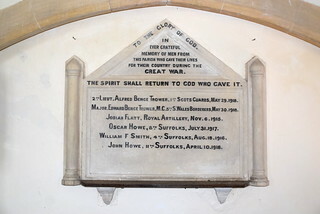 The Bence-Trowers, as they had become, gave both their sons to the War. The two boys died a day apart. 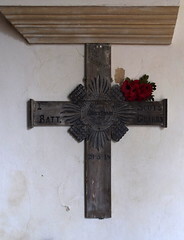 The surviving battlefield cross to Alfred Bence Trower, tucked across the nave near the door, is perhaps the most haunting thing of all in this place.